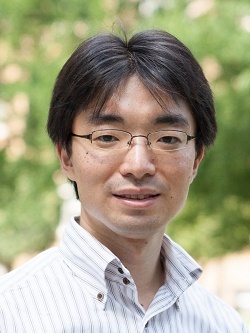 Hirokazu Sugiyama | Hirao-Sugiyama Lab. Hirokazu Sugiyama studied chemical engineering at the University of Tokyo (BEng in 2001, MEng in 2003), and earned PhD from ETH Zurich (2007). Subsequently he joined F. Hoffmann-La Roche in Switzerland, and held different positions in a start-up facility of biological drug product manufacturing with increasing responsibilities. His last position was Head of Prefilled Syringe Production. In 2013 Dr. Sugiyama was appointed as an associate professor at the Department of Chemical System Engineering, Graduate School of Engineering, the University of Tokyo, and started research activities on multiobjective design of pharmaceutical manufacturing processes. Dr. Sugiyama is conduction research on multiobjective design of pharmaceutical manufacturing processes. With tackling the following themes, he is exploring "Pharma PSE" as the new horizon of process systems engineering for realizing more superior processes. "A distribution-based approach for determining lot sizes in the filling of human-induced pluripotent stem cells"
"Environmental analysis of packaging-derived changes in food production and consumer behavior"
"A large-scale experimental comparison of batch and continuous technologies in pharmaceutical tablet manufacturing using ethenzamide"
"Relevance of regulatory constraints in designing pharmaceutical manufacturing processes: A case study on waste solvent recovery"
"Alternative generation and multiobjective evaluation using a design framework: case study on sterile filling processes of biopharmaceuticals"
"Data mining algorithm for pre-processing biopharmaceutical drug product manufacturing records"
"Approach for multicriteria equipment redesign in sterile manufacturing of biopharmaceuticals"
"Multiobjective decision-support tools for the choice between single-use and multi-use technologies in sterile filling of biopharmaceuticals"
"Designing interventions for behavioral shifts toward product sharing: The case of laundry activities in Japan"
"Design-oriented regression models for H2O2 decontamination processes in sterile drug product manufacturing considering rapidity and sterility"
© 1996-2013 Hirao Lab. © 2013 Hirao-Sugiyama Lab.